James Taylor is the coolest person on the planet. Period. No one comes close. It is a lazy, rainy Sunday morning. A good time to pop in a DVD, get comfortable, and enjoy. 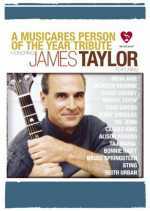 Today it was the Musicares Person of the Year Tribute Honoring James Taylor, taped this past February, featuring performances by Sting, Bonnie Raitt, David Crosby, Jackson Browne, the Dixie Chicks, Springsteen and, of course, Carole King. To many of us, James is an icon. “Sweet Baby James,” his first hit album, was released in 1970 and served as the soundtrack, along with Carole King’s mega-selling “Tapestry,” for my high school years. He soon followed that up with “Mud Slide Slim and the Blue Horizon,” also a timeless classic bearing one of my all-time favorite songs, “You Can Close Your Eyes” (performed during this tribute by Sting). Of course, when it comes to James, picking a favorite is literally impossible . 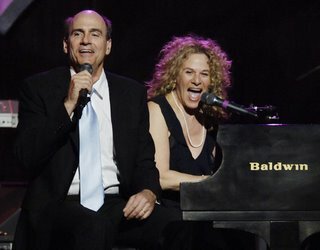 . . We used to alternate between spinning James, Carole and, of course, James’ main squeeze at the time, Carly Simon. There was some Elton John thrown in there for good measure. Musically speaking, those were very good days indeed. After surprising Carole King by joining her on “You’ve Got a Friend,” James took the stage with 1991’s “Shed a Little Light,” originally penned in commemoration of Martin Luther King, Jr.’s birthday. As I listened and thought about the words, I was reminded of another DVD I recently watched: A series of classic moments from the old “Merv Griffin Show” that we all grew up watching. You should pick up the three-DVD set if only to see the 1967 interview with Dr. King, filmed in black and white. It was arranged and Dr. King was accompanied by his friend, Harry Belafonte. James inspired a whole generation of musicians, myself included. I vividly remember sitting in my bedroom with the $20 guitar I finally convinced my parents to buy me at Gemco (the predecessor of Target), listing to his albums on my cheap little stereo system, picking out the chords. My sister and I used to type out the words to the songs we were learning to play using our manual Smith Corona typewriter. Then we’d write in the chords over the lyrics. We kept them all in a binder . . . that eventually mushroomed into two huge volumes that I still have on my bookshelf. Sounds so primitive now, doesn’t it? These days, of course, instead of popping in 8-track tapes, as I did in my ’68 Cougar, we pass around CD’s bearing the tunes we are learning and I pick them out on my beautiful Seagull electric acoustic guitar. I’m just not sure whether it was more fun then or now . . . I had never heard such things about Walt Disney, although he has been characterized as a perfectionistic tyrant. So it leads to the unanswerable question: If he were alive today, would he be a true, unapologetic bigot or would he have become enlightened over the past 40 years since his death? Would he have come to understand, as so many people who grew up enmeshed in ignorance, that James Taylor’s words are the ones we should live by? We’ll never know, of course. But I like to think that a man who brought so much joy to zillions of people would have been delivered from his anti-semitic and bigoted viewpoint. all men and women living on the Earth. in which our children can grow free and strong. and the road that lies ahead. We are bound and we are bound. What would the world be like without him?